Hi, I am interested in your 1972 Chevrolet C/K Truck (stock #5107-CHA) listed on Autotrader for $41,995. I'd like to get more information about this vehicle and confirm its availability. Sleek, loaded, comfortable, and powerful, this 1972 Chevrolet C10 Restomod knows how to stand out for much more than just its bold color. And the reason why it all looks exceptionally fresh is because theres less than 200 miles on the whole build! Bright Corvette Yellow and even brighter chrome...thats truly a bold way to make a lasting first impression. But also take some time to appreciate the details of this one. For example, the reason why a bold modern color looks so good on this pickup is because it has some timeless curves. The factory flared fenders are really noticeable thanks to the sleekness of expertly shaved door handles and a serious investment in getting all the sheetmetal butter-smooth. There are a ton of great additions that add to this cars aggressive side, including the custom cowl hood, smooth billet grille, clear taillights, and the dual exhaust tips integrated into the middle of the bumper (your license plate is now on a special motorized mount.) And there is a powerful stance with the Boyd Coddington Alloys staggered 18/20 inches front/rear. But even with all these additions, this Chevy never strays from that robust look we love in a classic pickup. Pop the remote door openers to reveal a full custom setup designed to both keep you comfortable and grab all the attention. After all, people are going to gravitate to the exterior yellow thats now joined by a fiery red. There are even custom flame-style LED lights in the door panels to drive home this sizzling attitude. Youll love how this is set up for comfort with dual bucket seats with a cup holder center console in-between. The carpeting, door panels, headliner, steering wheel grip, and even the seatbelts match this red for a great uniform look. Plus, this is loaded with all the best features, including power windows, an AM/FM/CD stereo, tilt steering column, and cold-blowing air conditioning. We especially love the gauge cluster borrowed from a 59 Impala. And those round readout pods are filled with Dakota Digital gauges glowing in red (yes, this truck is that well color-coordinated!) With a pickup thats show ready inside and out, you better believe the engine bay is a showcase, too. The ultra-smooth fender walls and firewall funnel all your attention to the bright and fresh V8. In fact, we dare you to find another component that can be polished! The build was completed last summer by Hot Rod Express, and with a name like that, you know they understand how to put power behind the shine. The crisp setup starts with a 350 cubic-inch crate V8. Its enhanced with a Holley four-barrel carburetor, aluminum intake, and headers that feed the rumbling dual exhaust. When you look at the undercarriage photos, the overall bright and clean setup shows you more of the advantages of a frame-off restoration. While this is an ultra-clean build from every angle, you wont be able to resist putting some miles on it. After all, this comes with great driving features, like a limited slip rear end, power steering, Wilwood power brakes w/discs up front, and a four-speed automatic transmission w/highway-friendly overdrive. 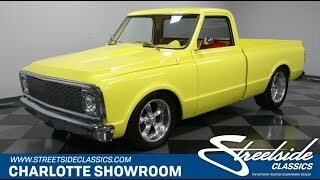 Complete with build receipts and owners manual, this is the complete and clean restomod pickup thats ready for everything from the awards show to the Power Tour. So dont let this fresh build slip away, call today!